As you may have noticed the Dock Penguins banner on the right in the widgets, but I’ll mention it in this post as well! If you may or may not know, the G.W.A. team hosts a forum called Dock Penguins. Meet new friends, join contests, and have a great time! Make sure to sign up here. I know I haven’t made a music video in awhile, but I just finished one. The stressful thing is that I keep having tough times with the quality so it should be up tomorrow morning, if not.. Then you’re just going to have to wait a little longer! Sorry guys! Finally! My new Club Penguin music video is finally out! I hope you all like it 😉 Share it with your friends if you want! Note: you can double click the video to comment, rate, and favorite. hey, MC is broken up, please watch the video. YOU MUST DOUBLE CLICK VIDEO SO YOU CAN READ THE DESCRIPTION. Gwa will rise. This is for good cause. Wow! I’m pretty sure this is my best one yet, what do you guys think? Double click video, so that you can comment, rate, and favorite! Hey, Everyone! Since it’s spring break, I’m going to have alot of free time at the end of the day, So I will be doing a few videos! 2 at least, and one of them I KNOW You are going to like! So keep in touch with my YouTube and WordPress for more information. In the next week, I have spring break and I’m going to be doing a few videos on my spare time! So just to let you know, keep in touch with my YouTube, and you can see the upcoming stuff! April Fools Party Coming Up, and ICKP Might go back TOGETHER?! There hasn’t been much going on in Club Penguin for awhile, but I’m going to talk about how ICKP might get back together! I don’t know, just vote for who you want, and I voted for GWA because wwe adam is my best friend and I care about him! New Blog Update + Mohd 222’s new video! 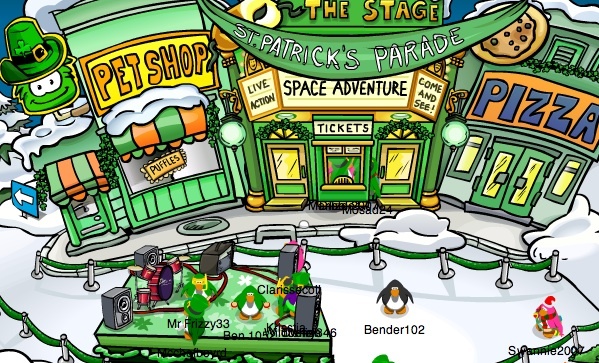 Celebrating St. Patrick’s Day is a tradition in Club Penguin! Every year we look forward to the weekend of Green! My favorite part is the Gigantic Hat, but let me know your favorite part! In other news: Space Adventure returned to the Stage today–with some cool improvements! As always, let us know what you like and even what you don’t! Mohd has made a new vid! It’s really cool and it’s one that he’s done by himself! Nice job mo!